Nico Coetzee – Welkom by my spartaanse blog. Ticking off bucket list items and adding new ones. Welkom by my spartaanse blog. Ticking off bucket list items and adding new ones. What is in a kilogram? Subscribe. I don't post often. But always without prejudice. 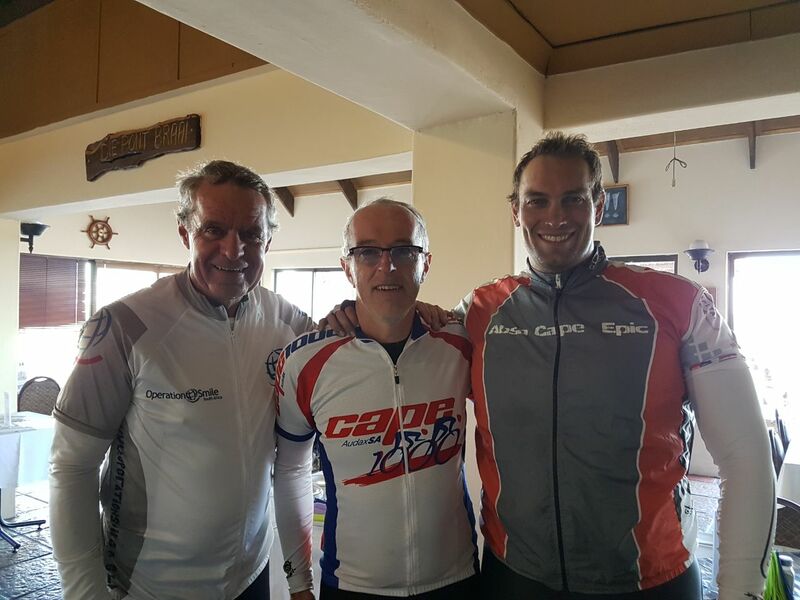 Audax South Africa turned 20 this year and many people would say it is all thanks to Eddie. To commemorate the occasion, we completed South Africa’s first ever Flèche, named after the man himself — Flèche Thomlinson. This was, without a doubt, one of my most enjoyable Audax rides yet. Not quite a team time trial, but unlike other Audax events, the focus is on a group effort. And you have to ride at least 25km in the last 2 hours. Teams ride different routes, but finish at the same venue. Rob Walker and myself, so not enough for even one team. But a quick email to the group saw just as quick a response. Adele Bellairs, Richard Baufeldt & Andrew Wheeldon were keen to join. It must be said, it takes a special individual to opt in at the drop of a hat to come and ride a 422km route through the night on the eve of the Easter Weekend. And that pretty much sums up the group. 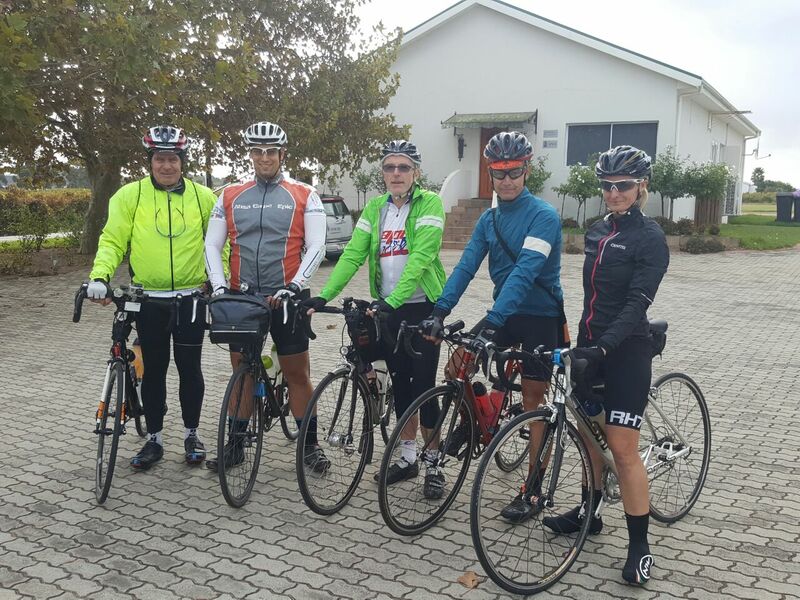 At the start – Richard Baufeldt, Nico Coetzee, Rob Walker, Andrew Wheeldon, Adele Bellairs. We left Vrede wine farm on Thursday 13 April 2017 at 5pm and got onto the familiar Old Paarl road through Klapmuts and onto Franschhoek. 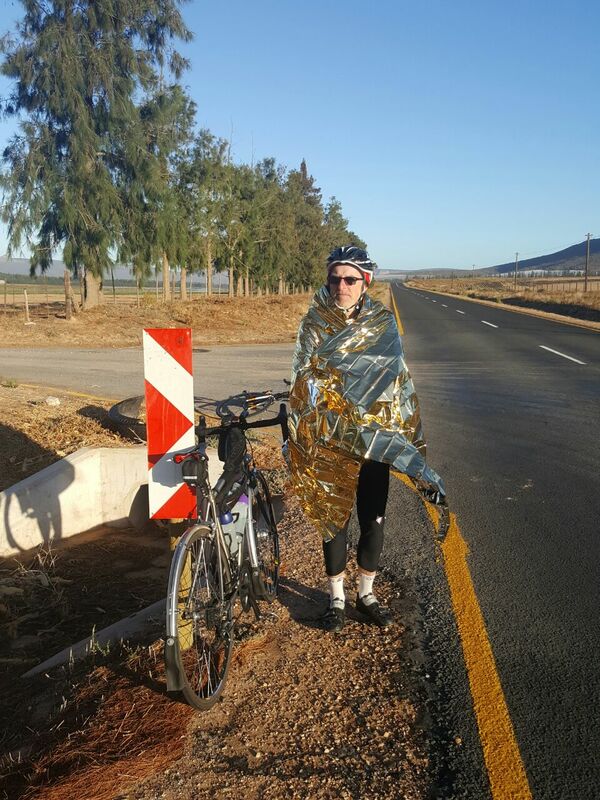 My last time on a bicycle was exactly a month ago during the Tour de Boland and I certainly felt it, falling behind the other 4 as we approached the first checkpoint. But some food & coffee did the job and I was ready to go again. It was raining as we rolled out of Franschhoek. Cold outside, but a beautiful night nonetheless, with the prospects of seeing the full moon later on. As we turned right towards Paarl there was less traffic and we eased into a nice rhythm. Entering Paarl, we missed the left turn to the main road and continued with the most direct option towards Wellington. And then it happened. We were riding single file through the outskirts of town. I was following behind the first rider. The roads were wet from the earlier rain. I looked up to see we were stopping at the traffic light and immediately got that dreadful feeling — Rob managed not to hit me from behind but split seconds later I heard the terrible sound of someone going down. It was Richard. Richard was lying in the road, next to his bike. Everyone got into action and helped, without moving him. Adele diverted the traffic and Andrew & Rob moved his bike to the island. After what felt like ages he eventually lifted his arm and I helped him to his feet. A quick check revealed that his carbon frame was still 100%, but that his Prevail helmet was split at the back. Like a true champion, he broke the fall of his bike by landing on his head. Jokes aside, we were all very relieved to see him back on his feet. He decided to go on to the next stop in Wellington, before the stiffness could set in. We made our way up to the street lights in Paarl’s main road to continue to Wellington. This was not a control point, but the Shell garage at the end of town proved a popular stop, being at the foot of the Bainskloof pass. Richard decided he wanted to continue, surely some adrenaline still fueling him on, and Rob stayed with him as they started the climb. I turned into the garage, with Andrew & Adele also opting to stop. Returning from the quick shop, Andrew & Adele informed me that they have decided to call it a day and return to safety. I didn’t blame them. In fact, I really appreciate their effort in coming out in such short notice to join us and look forward to the next ride. Andrew handed me some of his supplies and we parted ways. I am by far the slowest climber of the group and prepared myself for another solo effort over Bainskloof. Which I must admit, I thoroughly enjoy. Some me-time. And even though I love the descents, I know I wouldn’t see Rob & Richard again before our next stop in Wolseley, as the wet roads demanded some caution. By the time that I crossed the waterfall and got to the last long drag before the summit, the rain was coming down in full force. And so started my slowest ever descent of Bainskloof, being on the brakes consistently. At least the roads were quiet and I only encountered 2 vehicles over the pass and one of them politely enquired whether I’m enjoying the ride. At one stage I stopped to try and locate the source of an unpleasant but slightly familiar sound on the bike. I was right. When I turned my front wheel, the hub didn’t run smooth at all — I suspect the bearings have run dry and were on their last. With no means to fix this and it being the eve of the Easter Weekend, I just hoped it wouldn’t completely fail within the next 300 odd kms. Shortly before the Wolseley turnoff I passed three runners coming in the opposite directon, from Ceres, jogging in the road in the middle of the night, being followed by an official vehicle and two ambulances. Wonder what that was all about. We greeted each other in passing. I arrived at the 24hr shop a good 20mins behind Rob & Richard. They were having coffee. Richard was looking great for a guy who came off his bike not long ago, ready with a high five. Rob also mentioned how he had to put in some effort to keep up with Richard, who was riding as strong as ever. I informed them it was only the three of us. In order to complete the Flèche we all had to finish together. After a quick sandwich & chocolate milk we set off into the night. I really looked forward to the next stretch, as the rain was gone by now and the eerily quiet roads were lit by an almost full moon. We left Wolseley and turned left onto the R44, passing Tulbagh and going through the Nuwekloof pass. With only 48 meters of ascent, this would not be your best bet for an Everesting attempt (185 laps and over 1500km in total). We turned right and went through Gouda towards Porterville, happily chatting all the way. There’s no better way to start the weekend. The first time I drove here at night, in a car, without knowing about the wind farms, it took me a while to realise that the red flashing lights in the sky originated from the wind turbines. Not from aliens. But tonight I saw them flash out of sync for the first time. In Porterville we briefly stopped for a call of nature. Then tackled the 25kms of rolling hills to Piketberg, which you can see in the distance all the time. Most of this stretch was down to a single lane due to long-overdue roadworks, but I can’t wait to cycle this on smooth tar sans potholes. We turned a couple of these kms into a gravel section by pedaling on the untarred work-in-progress lane. I was eager to get to the Piketberg check point, as the garage now boasted a new convenience store and KFC. Upon our arrival, we also noticed a 24hr Spur and we cycled through the sliding doors and into the dining area. Our 4am breakfast was delightful and we spent a good hour here. Getting ready to leave, we knew the next part would be the most difficult — that dreadful stretch before sunrise. It was still dark and much colder outside than we were prepared for. 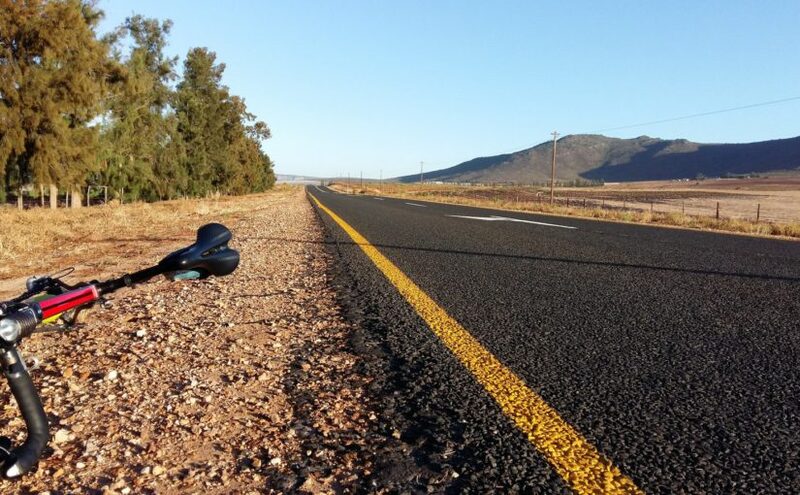 Luckily, we were about to explore a new road, as this time we didn’t go left in Piketberg to go over the mountain and on to the coast, as we promptly turned tight in the main road and followed a lovely stretch of road parallel to the N7 north. It was dark outside, but we could see the silhouette of the mountain on our left, as the first light started coming over the faraway mountains on the east. No cars, just us, side by side. We did see one more bicycle in the far and were slow to reach him. Rob speculated that it looks like a qhubeka bike. I certainly thought it was a 26’r MTB. When we finally reached him, it was a farm worker, pedaling like there was no tomorrow. Maybe he thought we were a bunch of scoundrels out to nick his bike. Or maybe he was just fighting the cold in the most natural way. When we made it to the end of the mountain range, the sun was already starting to appear in the far. We were still in the shade, but it wasn’t necessary to use the lights anymore. As a child I grew up in Clanwilliam, which felt like just over the hill from here, so cycling through this landscape brought a great sense of déjà vu. I absolutely loved it. Looking down from the Piekenierskloof pass when travelling towards CPT on the N7, I always stared in this direction, wondering how far the road goes and what happens here — and now we were cycling it. A few kms on and we saw a couple of Eland, right next to us on the left. It was rather fitting and somewhat obvious, seeing as we were on our way to Elandsbaai. 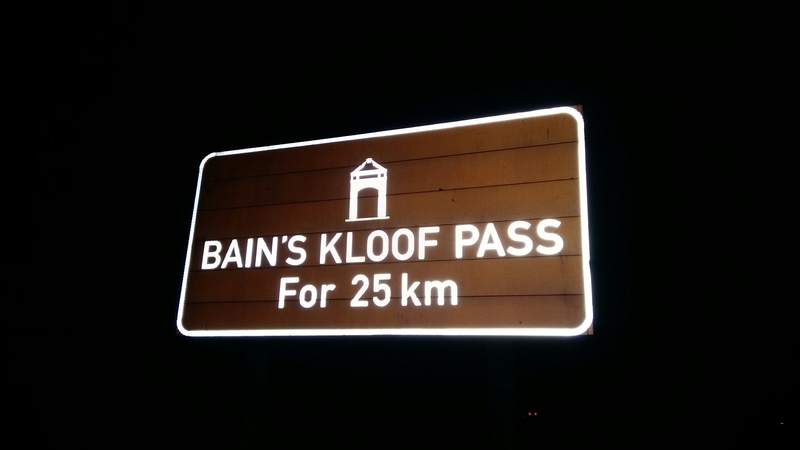 The only thing more descriptive would have been if I could take a picture of Rob & Richard in front of the Elandsbaai road sign, with an Eland between them – arm around the shoulders. We thought the day would heat up. But the opposite happened. As we dropped down towards the ocean we cycled through a valley and the temperature dropped all the way to just 1.5 degrees Celsius. Rather unexpected, especially as the sun was out and it was only April. After a while we stopped for a brief moment, just to regain the use of our fingers. We were keen to stop at the next venue for a proper breakfast, but there was nothing to be seen. Rob called halt and we stopped next to the road. He was freezing and whipped out his golden space blanket. Mental note: don’t ever go on a winter audax ride without one. It doesn’t weigh anything and its value cannot be underestimated. While he reflected rays of sunlight and posed for a picture, I sat down and promptly grabbed 5 mins of sleep. It helps to be able to power nap anywhere. I felt like a new person and the last stretch to the coast was pure bliss. We passed the Aurora & Redelinghuys turn-off and continued next to the wet(dry)lands towards the coast. The scenery was getting more & more beautiful with every passing kilometer. We all spotted the long hill up ahead and silently wondered whether that was the road we were supposed to take. It included one long sweeping right turn to get over, and from what we could remember according to the map we weren’t going to turn again before we reach the ocean. And luckily we didn’t have to, as we realized that was the Lambertsbaai turn-off. This day was just getting better and better. Just before Elandsbaai we found a lovely little breakfast spot and promptly pulled in for a well-deserved meal. We soaked up some sunlight and two chocolate milkshakes never tasted so good. After this newfound energy we slowly cycled into Elandsbaai for a picture on its iconic beach. 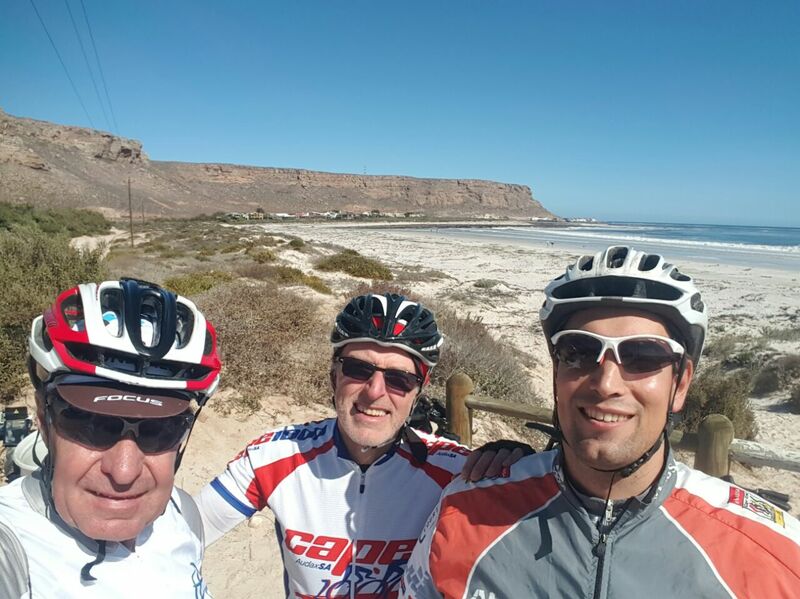 Team Flèche-light at Elandsbaai – Richard, Rob & myself. The worst was now behind us and it felt like only a victory lap remained. But how quickly things change. As we left Elandsbaai the wind picked up. We continued up a never-ending hill. From a distance I could see how the heavy laden trucks struggled to get over it and I had the deepest of sympathy, knowing my fate would be the same. That hill did protect us from the wind somewhat, as it was blowing much stronger when we reached the top. But what a summit it was, as below us lay the west coast, all the way towards Table Mountain — absolutely spectacular. When last have you seen a wind pump with the Atlantic ocean as its backdrop? We regrouped (read: R&R waited for me at the top) and continued down a fast descent to reach the coast again. From here on in there would be very few meters gained. We cycled single file, taking turns in front. 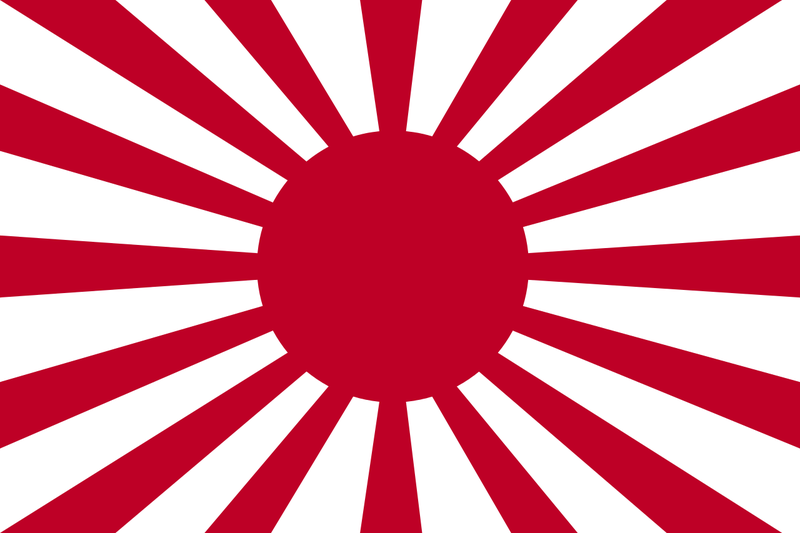 The earlier rains played havoc with any form of barrier protection and by now it felt like my rear end must have looked like that Japanese army flag. It was around 2pm when Rob called a strategy stop. Our next goal was to do the minimum required kms during the last two hours. The wind wasn’t playing along and we decided to take a final break. He didn’t notice the padstal less than 3kms back, so we returned there for a final stop. Sitting on the lawn in the shade outside, with way over 300km in the legs, we enjoyed the best venison pie I had since Peregrine, plus some ice cream. 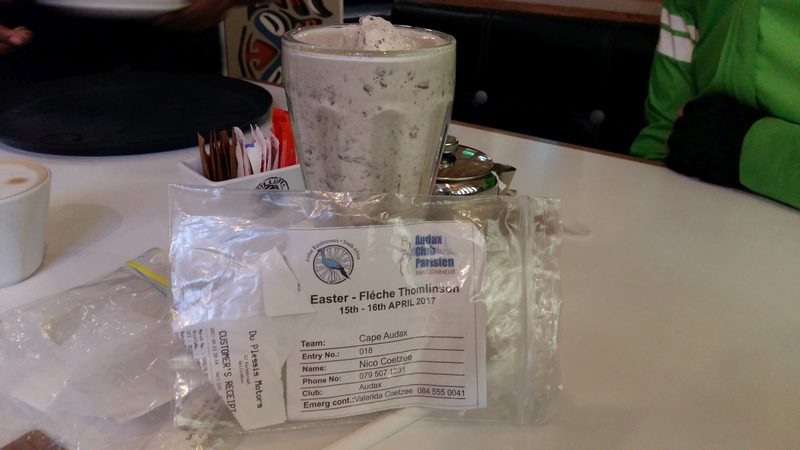 Isn’t this what an audax ride is all about? After this final stop we rolled out with a newfound lust for life. A few kms down the road we marked our progress at exactly 3pm, as this was the start of our final goal. I don’t mind the wind as much and was sitting very comfortable. In actual fact, we achieved our 25km requirement in just over an hour, despite the headwind. The only delay was losing 10 minutes to fix a puncture. Job done. We continued to the next town. By now the wind was howling and the traffic picked up quite a bit — it was Easter Weekend at the coast, nonetheless. Not long afterwards we rolled into Velddrif and straight into the hotel for a couple of celebratory beers. Yolandi & Ben met us there and Ken came through to collect Richard. After the ride we spend a lovely long weekend in Langebaan with our families. Good news: Richard is going strong, irrespective of his fall. He was back on the bike with a rehab ride on Sunday and a recovery ride yesterday. And you can check out Rob’s strava data here. As always, it was an absolute pleasure riding with these guys. The most amazing statistic I have seen in a while was that we have not gained a single meter of altitude during the last 2 hours of cycling. When last, if ever, have you experienced something like this? Eddie, thanks for taking charge of Audax SA for two decades already. You have enabled us to do some stunning rides, make new friends and see amazing places. Edward Thomlinson and his proud & supportive wife Jean, taken at Vrede Wines in October 2015. 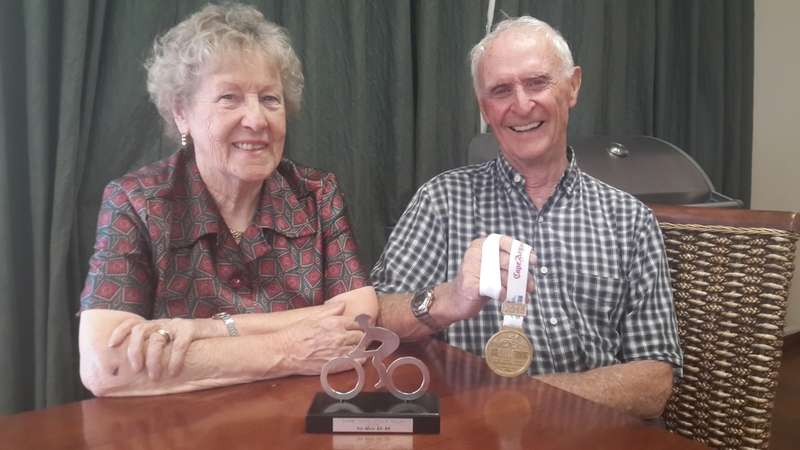 Eddie shows gold his medal for being the first male in age category 85-89 in the 2015 Cape Town Cycle Tour. Talk about dedication.